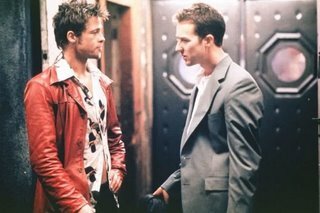 It may just be me looking too much into this but other than this movie having some great quotes it also paints most of our lives. 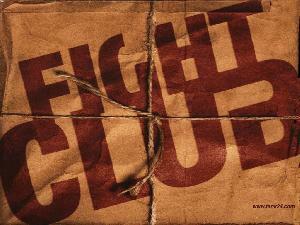 In the movie Fight Club is the release for people, tired of the routine and being slaves to the pound. The repetitiveness that we find ourselves in an all too similar cycle. My cycle on a different level to the characters of the movie pivoted on something last year. My life changed, from being lost at sea and feeling like I didn't have any respect for myself to becoming me again. Not getting deep so moving away from that but what made me relate to this movie today was how I see people that I usually see at the weekend. It reminded me of a part of the movie where they see each other outside of Fight Club. It's only at the weekend where people discard the image and really let go, all be it with plenty of alcohol but they become themselves or a version of themselves that they enjoy being. Walking passed people at train stations on the way to work and the smile or nod that is more than acknowledgement but true as in saying I will see you next when you are on it. The weekend is too short, I plan on enjoying it to the fullest though and whether it's dancing the night away or being with my children the release is needed as it's what breaks the cycle and sets us apart from the next person.